Is bat removal more expensive than you anticipated? Bat removal is expensive and completely necessary for your safety. 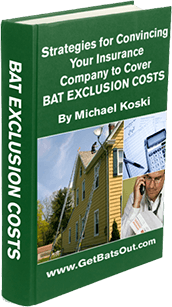 Why should your insurance company not cover bat removal? They have a few reasons they’ll give you… but we have a few tricks that can help you get your bat removal covered by your insurance. To receive your free “Bat Strategies” Insurance Guide fill out the form to start reading now! Yes, please send my free Insurance Guide via email download link. I understand that I may also receive helpful tips via email without obligation from Get Bats Out.